The situation surrounding Abba’s European licences at the turn of the 1990s can only be described as confusing as a number of different licencees issued CDs outside their historic territories. 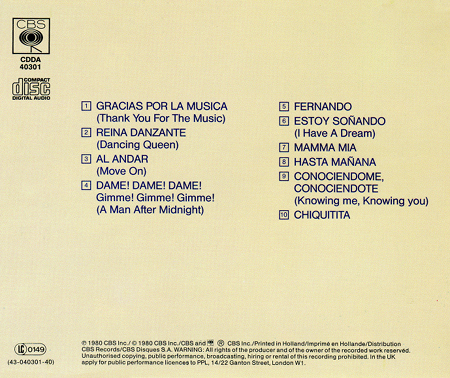 1989 saw the strange encroachment of RCA into the Spanish market with their version of Gracias Por La Musica while Abba’s British licencee CBS seems to have made several incursions into one of Polydor’s continental European strongholds at the same time. While RCA’s Iberian adventure ended with a single CD, CBS’s Dutch foray resulted was 100% more productive, yielding two CDs, although its choice of titles was equally eccentric. The most common of the CD titles is a single pairing Happy New Year with Angel Eyes, which was released as a novelty CD card in the Netherlands in the run up to Christmas 1989. Incidentally, the CD was able to fit in the card because it was issued as a three-inch CD, a relatively unusual format which was popular for CD singles at that time (normal CDs are five inches in diameter). There are actually two versions of this CD available: one has a different catalogue number and text layout than the other one. They are both identical musically and share the same matrix number. 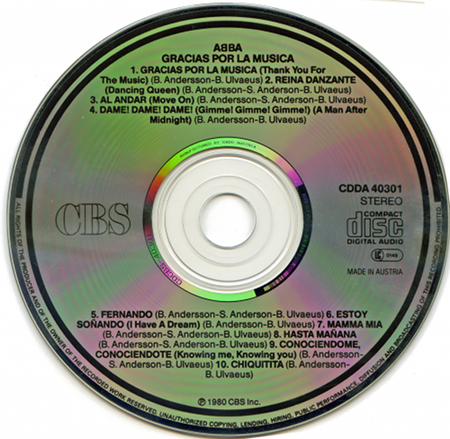 While the Happy New Year single is relatively uncommon, CBS’s second and final Abba CD release – Gracias Por La Musica – is among the rarest Abba titles ever issued. Indeed, no pictures of the title have ever been published on any Abba website until now. In common with Happy New Year, there appears to be two versions of this title – one version has a plain white back cover with bluish-purple text. Unfortunately, this website doesn’t have any pictures of that version but it does finally have images of the second variant, courtesy of US Abba fan Dave Turney. The pictures below make it perfectly clear that this title – which has often been misidentified as a US release – was actually distributed in Europe. The inserts were printed in Holland while the CDs were pressed at CBS’s plant in Austria. Unlike the first version, this version sports a standard CBS back cover, listing the contents against a light brown background. The inner booklet is a sparse two-page black and white affair, which provides further evidence of its European origin, containing abundant references to two of Polar’s song publishing arms, Polar Music AB and Union Songs AB. Many early CBS CD titles had generic back covers. It is unclear whether the UK reference has any significance or was just part of the label’s generic copyright text for that era. It can easily be identified from other CD pressings of the album because the artwork on the front cover is tightly cropped, removing most of the top and bottom sections of the ‘airmail’ border. All these CBS titles were likely to have been available for a strictly limited period of time as PolyGram took control of Polar Music in January 1990 and immediately began withdrawing Abba licences. In terms of value, Happy New Year is probably worth around €20 to €30 while Gracias Por La Musica is comfortably worth over €100. Titles in range: Happy New Year [version 1] (655 3291); Happy New Year [version 2] (656 463 1); Gracias Por La Musica [both versions] (CDDA 40301). 2 days later and I have unbelievably obtained ANOTHER copy of this Austrian pressing and this time the border is complete on the bottom and both sides while only partially visible on the top. So these were obviously haphazardly printed. The only true way to identify one of these pressings is purely by the catalog number. Both of my copies and the one pictured above have all been purchased in the USA. So perhaps these were marketed for us even though we clearly manufactured one ourselves. This might explain why these are not more widely known by collectors around the world. While my quest continues for the USA pressing of this CD (I told you it existed!) I took a chance on ordering a (very inexpensive) used copy from a US seller who gave very little details of Country/Catalog Number. It arrived today and turned out to be this Austrian pressing. (YAY!) While the front artwork is cropped, it is not nearly as cropped as Laura’s copy pictured above. There is definitely a hint of the “airmail” border on the bottom of my copy. Another interesting thing is this was not made in 1989. Inside my booklet is a hand written receipt notating the original sale of this CD dated September 6, 1988 !! There is something very usual about this CD. 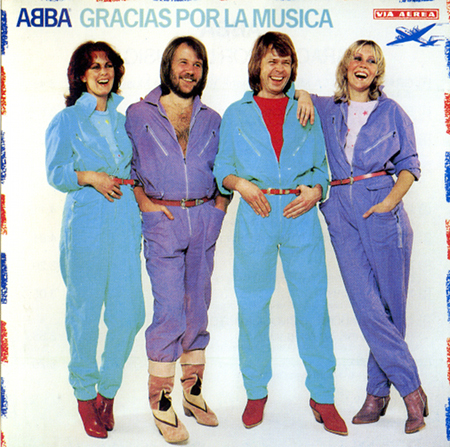 It’s a UK release CD, but anyone ABBA fan who has the US LP record will note that the catalog number for that is DAL-40301 on Discos CBS International, the label that released “Gracias Por La Musica. The rare 1990 US CD of this uses CD-80201! Weren’t UK’s Epic LP’s, in this series for ABBA? Thanx for this post as I’ve never seen the CBS Gracias Por La Musica in either version before.